注：欧盟建筑法规CRP（Construction Product Regulation） 305/2011/EU 全面取代欧盟建筑产品指令CPD(Construction Product Directive) 106/89/EEC, 并且从2013年7月1日起强制执行. EN 14716: Stretched ceilings – Requirements and tests methods. 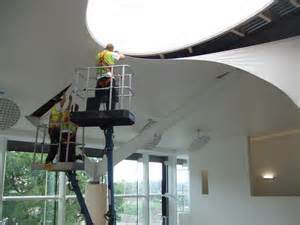 This document specifies the characteristics, specifications and test methods for stretched ceilings made up of single or multi-layer sheets, coated fabrics or fabrics made up of coated or monofilament yarn with a fastening system. It also specifies the method of conformity assessment for stretched ceilings. EN 12149, Wall coverings in roll form – Determination of migration of heavy metals and certain other elements,of vinyl chloride monomer and of formaldehyde release. EN 12280-1, Rubber- or plastics-coated fabrics – Accelerated ageing tests – Part 1: Heat ageing. EN 13238, Reaction to fire tests for building products – Conditioning procedures and general rules for selection of substrates. EN 13501-1, Fire classification of construction products and building elements – Part 1: Classification using test data from reaction to fire tests. EN 13823, Reaction to fire tests for building products – Building products excluding floorings exposed to the hermal attack by a single burning item. EN ISO 105-B02, Textiles – Tests for colour fastness – Part B02: Colour fastness to artificial light: Xenon arc fading lamp test. – 声学测试，隔音测试, ASTM E90, ASTM E413, ISO140-8, EN 771.